WTCF Los Angeles Fragrant Hills Tourism Summit 2017 was held on September 19. The Summit, themed “Impact of Globalization on World Tourism City Development,” attracted about 400 delegates from 51 countries and 87 cities. A total of 37 ministers and mayors, senior managers from international tourism organizations and representatives from international organizations including UNWTO and PATA were invited to attend the summit. The opening ceremony was hosted by Mr. Ernest Wooden Jr., Vice-Chairman of WTCF Council and President and CEO of Los Angeles Tourism & Convention Board. Chen Jining, Chairman of WTCF Council and acting Mayor of Beijing; Li Jinzao, Chairman of China National Tourism Administration; Zhu Shanzhong, Executive Director of UNWTO; and Mr. Eric Garcetti, Mayor of Los Angeles delivered remarks at the ceremony. Three bid cities made presentations to the Council Meeting, and the city of Helsinki was finally chosen to host the WTCF Fragrant Hills Tourism Summit 2019. 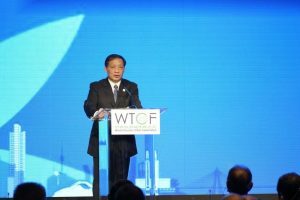 During this Summit, events such as the tourism exhibition, tourism trade and investment fair and tourism promotion meeting were held by WTCF to facilitate better communication and collaboration among its members who were able to showcase innovative tourism products and explore new market potential. The Tourism Investment Fair, co-hosted by the Committee of Investment, the Sub-Committee of WTCF, and the World Trade Center Los Angeles allowed participants to engage in efficient dialogue and cooperation opportunities between famous Chinese tourism and their counterparts from Spain and the US. During the tourism trade fair, 17 of the top 20 Chinese enterprises including CITS, CYTS, CTS, BTG, Ctrip and Tuniu.com had exchanges with nearly 100 enterprises from L. A. and others. Four themed forums of the summit will be held the on following day. The topics of the four themed forums are “Solutions to Challenges Faced by Tourism Cities, Competitive Strengths and Brand Building of Tourism Cities, Policy Environment Promotes Tourism Investment, and China’s Outbound Tourism: New Trend and Market Dynamics.” Mayors from tourism cities, executives from tourism institutions, and scholars are invited to discuss the most concerned topics such as travel security, brand marketing, advantages of infrastructure and resources, investment, etc.